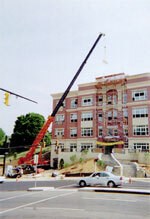 There are a lot of companies that specialize in residential crane rental in Virginia. However, the problem with that is when you get a company that only specializes in one area; you are limited on how much they can assist you when you have different types of projects. It may not even be that you have a commercial project; it may be that you have a rough-terrain residential job or something else that is out of the ordinary and when that happens you want to know that the team working with you is going to be able to handle that. Make no mistake, construction is a team job and even your subcontractors will play a key role in the success of your business. People hire builders based on reputation, experience and price. They do not care who does the work as long as it gets done. When you are working with a subcontractor you want to hire the one that understands that their work is going to reflect your company. We not only understand that but we make sure that you are getting the best quality service to ensure that our efforts reflect well of yours. When people review your work they will see that the job was done in time, safely and correctly. That’s what we deliver. Rent-A-Crane residential crane rental offers elite service throughout Virginia. One of the reasons we offer a free on-site consultation is because before you even have the project, we want to get involved in the planning as well as helping you put together a competitive bid and strategy for how the job is going to go. It’s that kind of dedication that has put us ahead of the competition for years and why we have worked with many of the top builders in the state for decades. Contact us today if you would like to learn more.